Plokta Issue 18 - What's in a Name? I HATE governmental bureaucracy, I hate standing in queues and filling in forms, I hate the dingy rooms and the horrible grey plastic stackable chairs and the threadbare carpet, I hate it all. I worked for the government for ten years and this probably scarred me for life. Luckily, these days, my life requires very little interaction with governmental bureaucracy -- the annual application for a parking permit is about all. I had nearly forgotten how horrible it all was, but yesterday it all came back to me, when I had to get a new passport. I'm actually here in England under false pretenses: I have an Italian passport and, as a member of the EU am entitled to live and work here. I also have an Australian passport but my membership of the British Commonwealth gives me no such rights. The Italian passport was due to expire in a couple of weeks and the last time I had to extend it they took weeks to send it back. I rang the Italian consulate and got to sit through about twenty minutes of recorded message before they finally produced the option I needed: to apply for a new passport if you live out of London and are aged over eighteen. I then listened to lists of all the local Italian consulates you can go to. It turns out that if you live in Berkshire, your local office is in Watford. Ma, non sfottete il prossimo, ragazzi. Or, as Aunty Sue would put it, bugger that for a game of soldiers. It would be easier to go to the consulate, which is at 38, Eaton Place, Belgravia, not very far from Victoria station. It took me a little while to find Eaton Place, even with the A-Z. The town planners cunningly tried to hide it by camouflaging it with other streets called Eaton Square, Eaton Mews, Eaton Mews North, Eaton Mews West, South Eaton Place, Eaton Close and Eaton Terrace. You think I'm kidding? Go look at the map if you don't believe me. When I finally found the right street, at least the numbers were large and easy to read. The whole road was a sweep of identical, three-storied Regency town houses, all painted white, with big, prominent numbers beside the grand double doors. With brass knobs. Did I mention this is a posh area of town? So I followed the numbers along, 1, 2, 3, 4, 5. They went continuously up one side then down the other, none of this alternating odd and even that the lower classes do. 31, 32, 33, 34? I looked up to the end of that stretch, where one building was covered in scaffolding. Oh, god, what if that's it? Chiuso per restauro, closed for renovation, just like every other monument in Italy. At least they're consistent. 35, 36, 37, 39 -- what? 35, 36, 37, 39. After standing there with my mouth open for a bit, my tongue was drying out. I finally asked one of the workmen on the scaffolding what the hell had happened to 38. He pointed over the road to a place with the Italian flag hanging outside it. 41, 38, 42, 43. Sure, why didn't I see that? The next hour and a half were spent filling forms in a dingy room with a threadbare carpet and gray plastic chairs, but I won't go over that again. My turn finally came. I stood at the window straining to hear the surly looking chap on the other side of the thick glass partition. He went through all the questions I had already filled in on the form, checking against their computer records. He got to the question about marital status. Last time, I was single, now I was married. This was inconsistent and unheard-of and needed investigating. I explained that I had married an Englishman in Australia three years ago. Did this somehow cause a problem for the Italian government? Ma si, signora. It seems that I would have to send them the marriage certificate and they would need to send it back to Australia to be verified and translated by the local consulate, and I really should have done this when I got married, then it would have to be sent back to London...By now, I was waving my arms about, shouting, no, no, no, forget I said it, I'm single, really, and what does this have to do with the Italian government anyway? We finally came to an agreement that, as far as the Italian government is concerned, I am, for official purposes, single. Sorry, Steve. But there is a small consolation. If an English woman is single, she is a spinster. The Italians have a different word for a single female and I think it says a lot about the two nations. 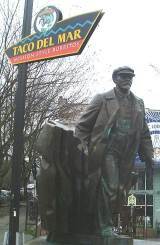 What if America had become a Communist state with statues of Lenin on every street corner? We're always on the lookout for tempting treats to give the cabal a new gastronomic sensation. So our eyes immediately lit up when we saw this in Yaohan Plaza's oriental supermarket. We assume that "Nissin Retort Pouch" is an almost perfect translation of "Boil-in-the-bag". 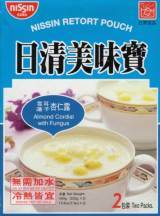 And "Almond Cordial with Fungus" is clearly the Japanese for "jolly tasty actually". But for some reason, none of the Plokta cabal -- or, indeed, any other visitors to Walthamstow, for that matter -- have been prepared to try it out yet. You could be the first.